Since the most recent incident of gun violence in the United States (I'm not going to bother to indicate which one since there will probably be another before I post this and several more between now and whenever you might be reading this post), there have been several memes circulating on social media from those advocating various measures to reduce gun violence. These memes vary to some degree, but the general idea is that the United States is not unique from other countries in terms of things like the number of doors in our schools, the use of Ritalin, violent movies and video games, mental illness, and so on. Where the U.S. is unique, the memes insist, is in the number of guns and the permissive laws around them. It is a fair point. Civilians in the U.S. have far more guns than civilians in other countries, and our gun-related laws are far more permissive than many other countries. If having more guns in the hands of civilians and fewer regulations around them made us safer, this would have to be the safest country on Earth. Unfortunately, it seems that the "more guns" solution is about as effective as prayer when it comes to preventing gun violence. But since I'm not really in the mood to think about guns or gun violence right now, I think I'll say something stupid instead. Besides guns, there is something else that the U.S. has far more of than any other country. In fact, I think one could probably find data that would indicate that we are at least as much of an outlier on this other factor when compared with the rest of the world as we are on guns. What is this other thing that we have so many more of than every other country? Christians. Might this have something to do with our gun violence problem? It seems unlikely. 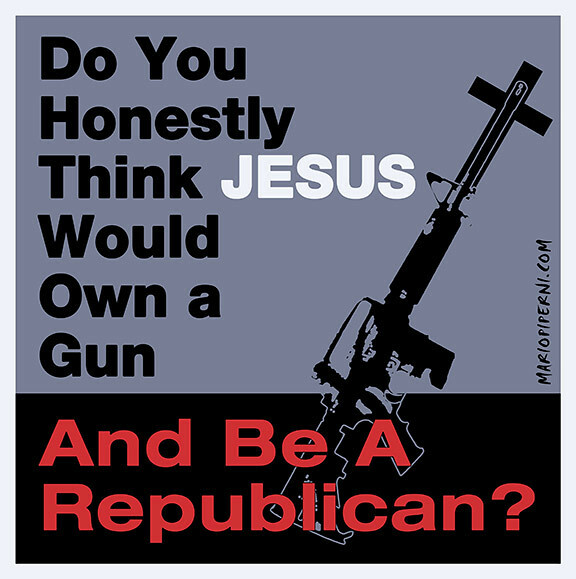 At least, it seems much less likely that we have more gun violence because we have so many Christians than because we have so many guns. And yet, I'm not sure we should let Christians and Christianity off the hook entirely. The Christianity in which I was raised all those decades ago was rather peaceful. It was not anti-gun as much as it was non-violent. And yet, the "muscular" sort of Christianity practiced today by many evangelical fundamentalist Christians and embraced by many on the right seems like it could be a contributing factor. Is my intent here to blame Christians or Christianity for gun violence? No. I'm not sure that would make any more sense than blaming "toxic masculinity," although I would argue that it would make more sense than blaming Marilyn Manson. On the other hand, I do think that there are many aspects of our culture that contribute to gun violence. I don't think it would be much of a stretch to suggest that some forms of Christianity have had negative effects on our culture, effects which may end up contributing to gun violence, directly or indirectly. And so, maybe it isn't so stupid to consider whether Christianity might be something else that the U.S. has way too much of, something that isn't terribly healthy for us, and something which just might be one of the many reasons we keep killing each other with guns. Maybe we'd be safer without at least some of those "Christian values" we're always hearing so much about.